Self-invention is a theme that runs through Mikhail G. Shapiro’s scientific career. 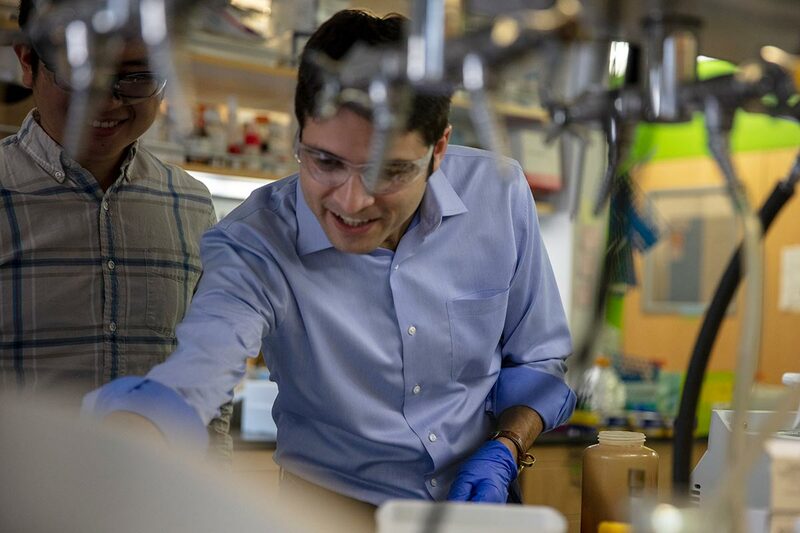 At the young age of 37, Shapiro, a professor of chemical engineering at California Institute of Technology, has earned praise from his peers for advances in biomedical engineering. Thanks to his inventor’s spirit, Shapiro has coopted magnetic fields and ultrasound waves for precise biological imaging. His work carries implications for a range of medical applications, such as cancer immunotherapy and engineered microbial drugs. Shapiro was born in Kolomna, near Moscow, in the waning years of the erstwhile Soviet Union. Fretting for their sons’ futures, his father, a computer scientist turned businessman, and his mother, an art instructor, immigrated to the United States in 1992. The family of four arrived in Washington, DC, where Shapiro spent his childhood drawn to cars and computers. Seven years later, he enrolled at Brown University for undergraduate studies. After a couple of false starts—he dabbled in philosophy and launched an ill-fated internet startup—Shapiro came to grips with his scientific calling and chose to major in neuroscience. At Brown, Shapiro’s brush with scientific research began when he was recruited by a team of neuroscientists to commercialize a technology aimed at enabling paralyzed people to move their limbs using only their thoughts. In its current form, the technology, dubbed brain-computer interface, helps patients overcome their impairment using electrode arrays surgically implanted in the brain; the electrodes translate neural activity into practical commands for performing simple tasks. Moved by the patients’ plights, Shapiro sought to develop noninvasive methods of monitoring and manipulating neural activity in the brain. To pursue that goal, he joined the labs of bioengineers Robert Langer and Alan Jasanoff at the Massachusetts Institute of Technology for doctoral studies. By then, the field of biological imaging had witnessed a revolution sparked by the development of genetically engineered fluorescent reporter proteins; the proteins’ optical properties help track an array of biomolecules in living cells. Yet optical imaging agents like fluorescent reporters face many shortfalls, some of which stem from the tendency of living tissues to scatter light, thus producing images of insufficient resolution. At MIT, Shapiro developed sensors that respond to magnetic fields rather than light. These sensors serve as contrast agents for MRI, allowing researchers to directly visualize clinically relevant biomolecules, such as the neurotransmitter dopamine, in the brain of living animals; dopamine is implicated in conditions like Parkinson’s disease and depression. After a brief foray into the biotechnology industry and a postdoctoral stint at the University of Chicago, Shapiro began an independent research fellowship at the University of California, Berkeley. There, continuing the theme of imaging tools, Shapiro came upon ultrasound. Long a staple of noninvasive medical diagnostics, ultrasonic waves were rarely used for imaging molecules and cells at the time, partly due to the lack of suitable molecular sensors in living tissues that can respond to ultrasound. Shapiro repurposed a group of proteins called gas vesicles to serve as ultrasonic reporters for molecular imaging. Discovered more than a century ago in some bacteria, gas vesicles are made of gas-permeable protein shells that serve as nanoscale flotation devices. Shapiro showed that gas vesicles could be purified from these bacteria, injected into living mice, and detected in the blood and liver using ultrasound. The approach offered a noninvasive, high-resolution imaging alternative for basic research. On the strength of his accomplishments, Shapiro was appointed an assistant professor in chemical engineering at Caltech in 2014. There, Shapiro and his colleagues succeeded in engineering gas vesicles into bacteria. In a Nature article, Shapiro showed that the bacteria Escherichia coli and Salmonella typhimurium—which lack natural gas vesicles—can be precisely localized in living mice by genetically engineering gas vesicles into them. Extending those efforts, Shapiro reported that gas vesicles can be used to visualize bacteria in the gastrointestinal tract and tumors of mice.